You control the company … who controls where you are in the marketplace? The facts are clear. The trends are clear. The synthetic turf industry is changing. The old ways of doing things will not hold. No matter where you are in the value chain—your competition is working to transform the way they do business. We’re living in an increasingly digital and globalized world. Every industry either has been, or soon will be, impacted by the forces of technology and global competition. Almost every company we work with tells us- our industry is different. Any business leader that thinks their company or industry is immune from these forces is doomed to fail. The old business approaches, which by and large grew out of the carpet industry, are obsolete and woefully inadequate to address today’s strategic imperatives. Valuable lessons can be learned from mature players, powerhouses no less, in other industries that failed to respond effectively to the imperatives of their day. Remember Polaroid and Kodak? Remember Magnavox? Blockbuster? More recently, Sears and Toys “R” Us? The changes they faced were nothing compared to what’s to come … in all industries. The answer to success in a world of rapid change and uncertainty, driven in part by technology and globalization, lies in yourrelentless commitment to continual innovation. Constantly changing. Not accepting the status quo as a given. Not protecting what you have at the expense of where you can go. Never standing still. Whether you are a yarn supplier, a turf or base system manufacturer, an infill provider, a specifier, a distributer or installer, or a provider of other products and services in the industry, rest assured that you are alreadyimpacted – it just hasn’t hit you in the face yet. Three decades of Proven Results! We have a three-decade track record of helping companies excel … in understanding markets and trends, strategic focus, product development, manufacturing and supply chain optimization, and facility design. What’s holding you back? Want to learn how we can help you? CONTACT US. Disruption is Staring You In The Face … Ignore It and get Blindsided like Someone Ran a Stop Sign!! The phenomenon of rapidly increasing digital technology and globalization is turning the traditional synthetic turf industry model on its head. The successful industry players of the future will be those who effectively respond to this change. Will you be disrupted? Or will you find your opportunity in the space to be a disruptor? Foreign competitors are knocking at your door. And no matter how much you try to defend through legislation and tariffs, through price and distribution, all you are doing is kicking the can down the road. How’s that working for you today? How will it work for you tomorrow? Digital technology is transforming how products are made, marketed, sold, delivered, installed and serviced. Any company in the 21st Century that doesn’t view itself as a digital company will fail. What part of your company can be replaced by a couple of smart millennials backed by a Venture Capital fund?Or a foreign investor? Not your whole company, just enough of it to disrupt your profit?. Industry barriers are being broken down and new opportunities are being created … while at the same time destroying long-successful business models. Manufacturing technology in combination with globalization demands that companies not view themselves as suppliers so much as ecosystem drivers and thought leaders. Technology is increasing the knowledge and sophistication of consumers. It is also placing unprecedented demands on industry players to up their innovation game. It requires business leaders to look at business from an ecosystem, rather than a value chain, perspective. The old commodity mindset that was emblematic of much of the industry for so long is a recipe for certain failure. The key to success is innovation. Not just product innovation, not only innovation in manufacturing, not only innovation in the way products are sold and delivered … a new, radically different and innovative business model is needed to prosper in the digital age. Do you view yourself as a supplier, one of many cogs in the wheel with partial knowledge of the needs and buying characteristics of the end user? Or have you extended beyond that, playing in multiple places along the value chain but still, at the end of the day, nothing more than one of many value chain players? If you’re only talking to people in your industry you’ll die there. Outside perspectives, spanning three decades across many industries, are critical to success. Learn from others to ensure your own success. 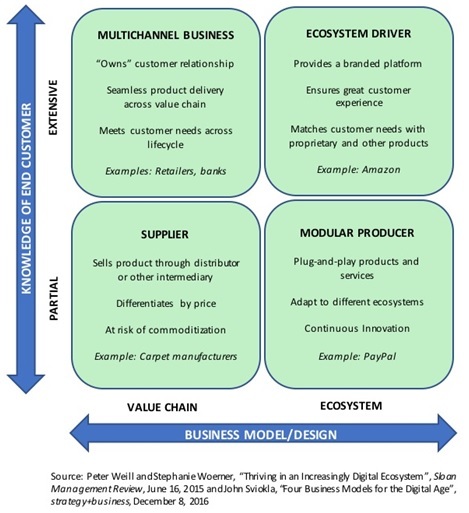 First, companies need to determine the extent to which they want to control the value chain or be part of a more complex ecosystem.Second, they need to decide how much they want to invest in knowing their end customers.They can choose to operate as (1) suppliers, (2) omnichannel businesses, (3) ecosystem drivers or (4) modular producers. Which quadrant is your business currently in? Where should you be in order to prosper, not just survive, going forward? Or have you truly transformed your business to become an ecosystem player and, ideally, an ecosystem driver, effectively owning your space? Will you wake up one day only to realize you have been disrupted? Or will you be a disruptor? The choice is yours … but time is running out. You can get ahead of the curve, but only by responding quickly and intelligently. Our combined business strategy expertise and synthetic turf experience can help you figure out how best to pull ahead of the pack and ride the wave of innovation instead of crashing on the rocks. With our insights and proven track record across many industries,combined with extensive experience in the synthetic turf industry across the value chain, we can help you figure out how best to navigate treacherous waters to ensure your success. We are unique in that we aren’t immersed in the industry day-to-day. We provide a fresh, outside perspective, gleaning insights across many industries and leveraging our understanding of disruption, to help you put the right strategy in place. Our outside perspective can help you “get out of your box” and learn from leaders in other industries. Contact us for a free, no-obligation conversation. We’d love to share our insights with you.